We offer free on-site estimates as well as a 10% discount for Seniors, Military, & Churches. Run by a husband and wife team, Kannapolis Glass & Glazing has been a fixture in the Charlotte area since 1982. We have more than 35 years experience as a glass company, so we know all about value and service. With those big box retailers, you get what you pay for. 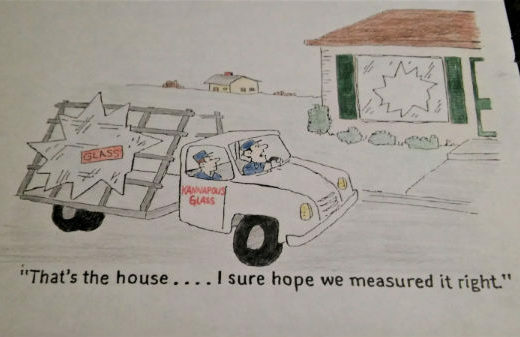 You might find their bids come in lower than most glass installation companies, but the quality of materials and workmanship is far inferior to what you get from Kannapolis Glass & Glazing. Kannapolis Glass & Glazing handles all types of residential glass installation job, and we travel out of the immediate area to serve our commercial customers. We’re a not just a company that handles window and glass door replacement. Kannapolis Glass & Glazing specializes in the installation of custom glass showers and all other types of applications. We know which materials represent the best value, and our base of satisfied customers would agree this husband and wife operation brings only the best service to the table. Call us today for a free on-site estimate.